I read recently from the Blog of Ian Dickson that 99.7% of our daily functioning is controlled and driven by our sub-conscious.Now that is an amazing stat. 99.7% of what we do everyday is controlled subconsciously. That includes our breathing, our heartbeats and blood circulation …but it also includes our habits that have formed and control much of our thoughts and views on the world. Our habits can make us or break us, and I figure that most of us acknowledge that, however I am not sure that we actually do realise the seriousness in relation to our habits. We are truly on Auto-Pilot in so many ways when it comes to us living. 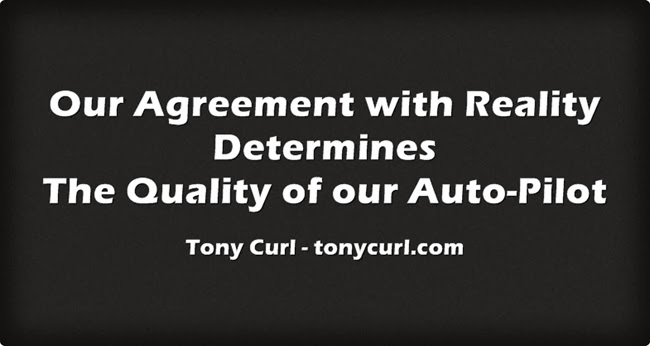 The quality of our Auto-Pilot determines the quality of our life. There is good news. We still have conscious thought. And our agreement of reality can be changed by ourselves. Our view of the world can be changed by what we tell ourselves. You don’t have to be stuck with your agreement with reality. If you are unhappy with your view of the world, it can be changed but does requires action, effort and persistence. So stop telling yourself crap….garbage in, garbage out. Start focusing on what is good in your life. No matter how small…by focusing on the positive you start to change your view to positive. And by thinking positive, you start to attract the positive. Affirm yourself daily. Make a daily agenda item with yourself. Analyse the good things that happened during the day. Recognise the positives and make plans for more tomorrow. Take action to break bad habits. Get out and go for a walk. Be fully present with loved ones. If people come to whinge, politely refuse to be part of their plan to offload pain into your life. The fact is, we can all do this. And many other strategies are out there. Do you want to share yours? Empowered Life- Don't give in to your Demons.